The Riverwalk Center and downtown Breckenridge are shown here on Jan. 25. The performing arts venue was closed after an equipment failure led to flooding on March 1 and town officials hope to get the venue reopened by mid-March. 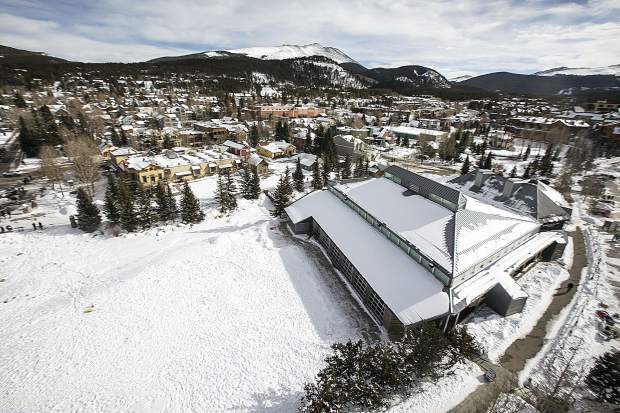 One of Summit County’s premiere performance venues, the Riverwalk Center in Breckenridge, isn’t expected to reopen until mid-May after flooding destroyed the stage and rendered the center hazardous to people. Around 10:30 p.m. on March 1, the Riverwalk Center’s backstage area became flooded. No one was in the area at the time, and the floodwater flowed onto the main stage and into the wood substructure. The water has made the general area, including the entire backstage and amphitheater, temporarily hazardous to occupants, according to a town-issued news release. As a result, the Riverwalk Center amphitheater and backstage areas will remain off-limits to anyone not authorized to be working in the area due to the contamination and air quality concerns. The news release blamed equipment failure for the flooding, but the exact cause remains under investigation. The box office and administration offices remain open, but the scheduled events at the Riverwalk Center have all been canceled while repairs are being made. Currently, the recovery process is moving along as expected, according to the town. The damaged materials have been removed from the backstage area, including all tile and carpet. The stage’s hardwood and subflooring wood have also been removed. The concrete under the stage and backstage is in the process of being deep cleaned before stage reconstruction. The new wood to be used on stage is arriving at the Riverwalk Center to begin acclimating to the venue, and the backstage area and stage will be reconstructed in the coming weeks. The town and Breckenridge Creative Arts hope to have the Riverwalk Center reopened by mid-May, though the date will be dependent on labor and materials. According to Breckenridge Creative Arts, 11 events have been canceled or are working to relocate with four more that may still have to be relocated, depending on the timeline of repairs.